I have been a busy lady! Since moving up to this most wonderful part of the world which daily brings us visions of joy (yesterday was a little deer scampering across the lane and evening sunshine mistiness on the walk to the shop and an epic moonrise on the way back) I have been working hard on learning silversmith techniques. My first triumph was a short length of rather delicate and unfinished chain which excited me as it was my first exploration into soldering and hand forging chain links. It was pretty rubbish! Ha! 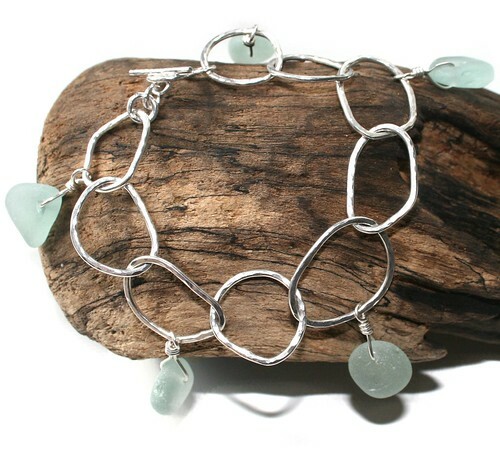 I've stuck at it and this morning I finished a piece which I started on Sunday with some sterling wire, solder, sea glass and tools. 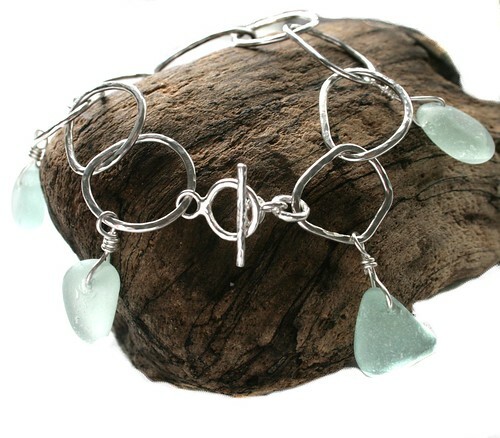 Using 1.5mm sterling silver wire I created chunky, organically shaped links and a toggle clasp, gave the chain a lightly hammered texture before wire wrapping some aqua sea glass droplets on alternate links. I am pleased with how this charm bracelet has turned out and have already drilled some double sided blue and white sea pottery for the next one, although I will have to wait until my thumbs have recovered from the slightly too enthusiastic hammering and filing! This bracelet will first be on display for sale at the St. Abbs Wool Festival on Monday 30th August.